This article is about the Internet company. For the number, see Googol. For the search engine, see Google Search. Mountain View, Mountain View, California, U.S.
A man signing in at Google's main office, Googleplex. Google is a multinational corporation from the United States of America. It is known for creating and running one of the largest search engines on the World Wide Web (WWW). Every day more than a billion (1,000,000,000) people use it. Google's headquarters (known as the "Googleplex") is in Mountain View, California, part of the Silicon Valley. Ever since the 2nd of September, 2015, Google is owned by a new holding company called Alphabet Inc, which has taken over some of Google's other projects, such as its driverless cars. It is a public company that trades on the NASDAQ under the tickers GOOG and GOOGL. Google's search engine can find pictures, videos, news, Usenet newsgroups, and things to buy online. By June 2004, Google had 4.28 billion web pages on its database, 880 million (880,000,000) pictures and 845 million (845,000,000) Usenet messages — six billion things.[source?] Google's American website has an Alexa rank of 1, meaning it is the most widely visited website in the world. It is so widely known that people sometimes use the word "google" as a verb that means "to search for something on Google"; but because more than half of people on the web use it, "google" has been used to mean "to search the web". Larry Page and Sergey Brin, two students at Stanford University, USA, started BackRub in early 1996. They made it into a company, Google Inc., on September 7, 1998 at a friend's garage in Menlo Park, California. 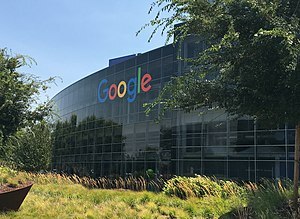 In February 1999, the company moved to 165 University Ave., Palo Alto, California, and then moved to another place called the Googleplex. In September 2001, Google's rating system (PageRank, for saying which information is more helpful) got a U.S. Patent. The patent was to Stanford University, with Lawrence (Larry) Page as the inventor (the person who first had the idea). Google makes a percentage of its money through America Online and InterActiveCorp. It has a special group known as the Partner Solutions Organization (PSO) which helps make contracts, helps making accounts better, and gives engineering help. Google makes money by advertising. People or companies who want people to buy their product, service, or ideas give Google money, and Google shows an advertisement to people Google thinks will click on the advertisement. Google only gets money when people click on the link, so it tries to know as much about people as possible to only show the advertisement to the "right people". It does this with Google Analytics, which sends data back to Google whenever someone visits a web site. From this and other data, Google makes a profile about the person, which it then uses to figure out which advertisements to show. The name "Google" is a misspelling of the word googol. Milton Sirotta, nephew of U.S. mathematician Edward Kasner, made this word in 1938, for the number 1 followed by one hundred zeroes (10100). It is said that the word "googol" was chosen as a name for this number because it sounded like baby talk.[source?] Google uses this word because the company wants to make lots of stuff on the Web easy to find and use. Andy Bechtolsheim thought of the name. Android is an operating system for mobile devices and was originally made by Google as part of the Open Handset Alliance, which Google leads. It is the chief competitor to Apple's iOS and Windows Phone by Microsoft (now discontinued). Google Adsense is a free program that enables website publishers of all sizes to display relevant Google ads and earn money. Google Analytics is the enterprise-class web analytics solution that gives one rich insights into his website traffic and marketing effectiveness. Google Alerts Google Alerts are email updates of the latest relevant Google results (web, news, etc.) based on one's choice of query or topic. Google Allo is a software for discussing with other people live. Google Assistant is a virtual assistant application built into Android devices. Blogger is a free tool that allows users to publish blogs on a Google website. Google Books lets people search for books. Google Calendar is an online calendar. Google Chrome is a web browser that Google made. Google Docs is an online Google full of docs. Google Drive is an online document editor. Google Earth is the 3D version of Google Maps with a digital globe. Google Groups is a place for users to discuss topics. Google Images is an image search utility. Google Maps is a service from Google to provide satellite pictures and road maps for everywhere around the world. Google Pay is a way to pay online. Users can send money using their credit cards or bank accounts to other users. Google Photos is a software for organizing and editing photos. Google Play is a sector that has games, and other things. Google Products is a pack of Google software. Google Search is a search utility. Google Shopping lets the user find out about things for sale on the Internet. Google Translate is an online translation service. It can translate websites and text into other languages. Google Sites is a service for making websites. Google Video is a video search utility. Google+ is a social networking service that is like Facebook. The service launched on June 28, 2011. Gmail is an e-mail service that Google started in 2004. It is called Google Mail in the United Kingdom and Germany. Users get free space to store e-mail. Hangouts is an instant messenger where one can talk to friends. YouTube is a video hosting service which was bought by Google from PayPal for 1.65 billion dollars and now runs as a Google service. ↑ "Google Inc, Form 10-K, Annual Report, Filing Date Jan 29, 2013". secdatabase.com. Retrieved Mar 8, 2013. ↑ "Google Inc. Annual Reports". Google Inc. March 31, 2017. Retrieved November 14, 2017. ↑ Koller, David. "Origin of the name, "Google." Stanford University. January, 2004. ↑ "Google Play". Retrieved 2018-11-23. This page was last changed on 10 April 2019, at 16:15.